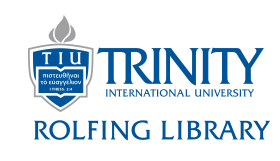 Dissertations, theses and projects produced by students at Trinity International University. Includes some full text. All dissertations, theses and projects from libraries around the world. You may try requesting them through Interlibrary Loan. Google Scholar is a simple way to broadly search for scholarly literature, including dissertations & theses.